This recipe comes from Craig Boyack at coldhandboyack. He’s an author rather than a baker, but has been making these gorgeous rich rolls from his Grandma’s recipe for years. I’ve turned it into a more formal recipe than he had, (I know he won’t mind me saying that as he described what he posted as not really being a recipe), and apart from a couple of small tweaks, I think I pretty much recreated what he described. – A little oil for greasing. 1. Tip the yeast into 1/2 cup lukewarm water, mix with a fork, set aside and mix again a few times until you use it to avoid clumps. 2. Place the milk, sugar, butter (or shortening), and salt in a pan on a gentle heat, and warm until the sugar and salt have dissolved and butter has melted, stirring all the time – don’t let it boil. 3. Pour the liquid into a large bowl and leave it to cool for about 15 mins. 4. Add one cup of flour to the liquid and mix it in well, preferably with a balloon whisk. Don’t worry if a few little lumps remain despite your best efforts (I did worry, but it all turned out fine in the end!). 5. Add the beaten eggs to the mixture and whisk in. Then add the grated parmesan and minced garlic, mix it in well. 6. Check the temperature of the mixture with your finger, it should be just a little warm, if it’s too hot for your finger then it could kill the yeast, so add some more flour. Once the temperature is good, pour in the yeast mixture and stir. 7. You now need to work in the rest of your flour. Add it one or two cups at a time, you may not need all of it, or you may need more, you want to end up with a good, workable, non-sticky dough. I found it easiest to use a pallet knife to work the flour in for the first few cups, and then switched to using my hands nearer the end. 8. Once your dough is ready, tip it onto a lightly floured surface and knead for about 10 minutes until it is smooth and elastic. Your hands should stay clean while you’re kneading, if you find that the dough is coming off and sticking to your fingers, then add a little more flour. 9. Place the dough into a lightly oiled bowl or large pot, cover with cling wrap or lid and put it in a warm place for about an hour until it has doubled in size. 10. Tip the dough onto the counter and punch the air out. Craig’s recipe said to then leave it for 10 minutes, but I was feeling rebellious so I didn’t, instead I lightly kneaded it again for about 2 minutes. 11. Divide the mixture into equal sized pieces. My pieces were just over 100g each and I ended up with 23 rolls, but you can vary this depending on what size and shape of roll you want. Then shape them into rolls. I went for simple round rolls (Craig did knots with his). 12. Place the rolls onto trays that have been lined with baking paper and lightly sprayed with non-stick cooking spray (that wasn’t part of the original recipe, not sure if it’s essential, but just in case!). 13. Cover the trays with cling wrap and leave them in a warm place to rise for about half an hour. The rolls with rise further during cooking, so make sure after this second rising that there is still enough expansion space between them all. 14. Using a sharp knife, cut two slits into the top of each roll (this is just for decoration as my rolls were just plain round). 15. 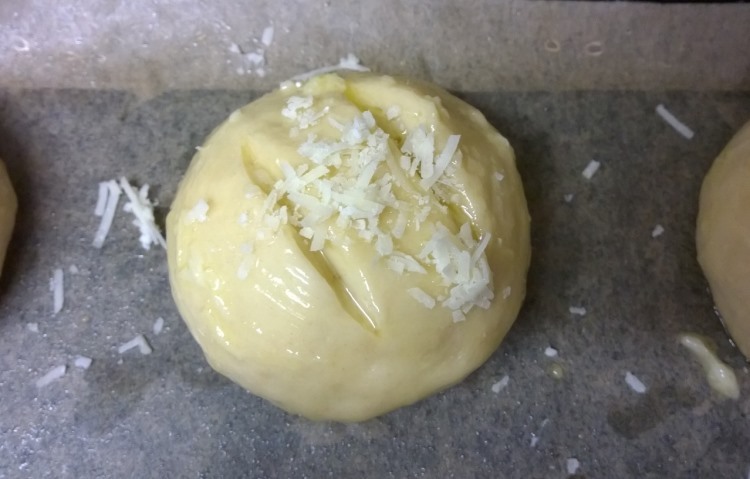 To make the topping, melt the butter with the minced garlic, stirring well to get the garlic taste through the butter. Brush this generously over all the rolls. Finish by sprinkling the parmesan on top of each one. 16. Bake in a preheated oven 200C/400F for…well, mine took 17 minutes, but Craig’s only took 12-13 minutes, so maybe his were smaller, or perhaps the knotted shape cooks quicker, or maybe just the difference in ovens, who knows! I would say check them after 12 mins by gently tapping the bottom of one to see if it sounds hollow, if not, then go a few minutes more. Anyway, thanks Craig for sharing your Grandma’s recipe, and happy baking everyone! When making popcorn the old-fashioned way, add some salt to the oil in your pot. Not too much. Tonight I decided to add some garlic powder, just because. OMG, I’m in love. I inhaled the bowl. My bad but tasted so GOOD. Ooh that sounds good! I’ll try that if I ever make popcorn in the pan again! – We have a little popcorn machine that just air pops it, we can’t put any oil or flavourings into the machine. Of course we add butter and salt afterwards thought! I had one of those till it gave up the ghost, then I started making popcorn in the microwave in a brown lunch bag. No stapes, just fold down end. Works great. Takes time as you can’t put a lot in and must watch the time so you know for next time. BTW. I made popcorn in oil a couple of days ago. Added a little salt to oil and decided to try garlic powder as well. It was out of this world. This part doesn’t work in the microwave and certainly not in the hot air popper. Oh the brown lunch bag is a good idea – your own version of the microwave popocorn bags you can buy! It was my recipe, based upon grandma’s baking practices. I think your recipe sounds much easier to duplicate. I learned with handfuls and pinches. Thanks for sharing this, and I hope you enjoy them. Oops, I gave your grandma too much credit! You had everything there in your recipe, I just quantified some of it and wrote it out in a more recipe way. Mine are definitely much darker than yours looked, but they taste fab, with a nice crusty exterior, if I’d cooked them less then the inside wouldn’t have been done. I agree with you that it would be good to try different flavour combinations. I’ll try to reblog it later tonight. I want my book giveaway to stay on top as long as possible. Kind of selfish of me, but there you have it. If you want to reblog it, there’s nothing to say it has to be the same day, you could leave it a few days. Your book is the most important thing! I think you just qualified for sainthood. I’ll do it though. Thanks for understanding. I love that you make your own bread. 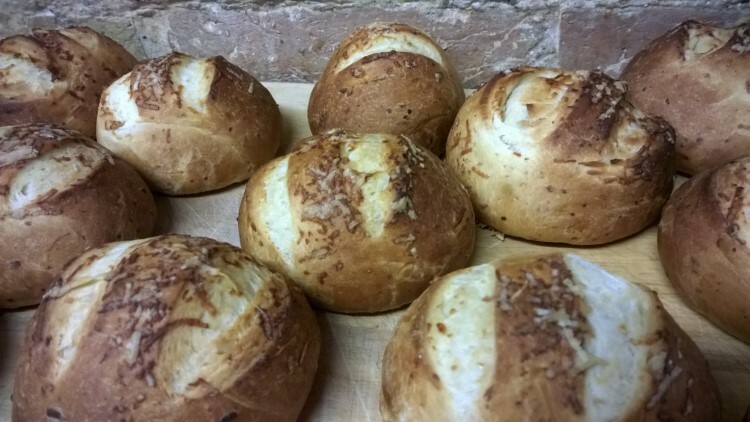 Nothing quite beats homemade bread (or rolls) straight from the oven. I never take the time to make it. I used to use my bread maker a lot, but even that has fallen by the wayside. It helps that our local market sells such wonderful bread, but still, it’s never the same as homemade. These look delicious. I never used to make my own bread, but now I really enjoy the process; kneading dough is quite therapeutic, the trouble is we don’t eat as much bread as I want to make! Also it’s pretty time-consuming isn’t it, but I kind of combine things, like I’ll bring my laptop into the kitchen and catch up on a TV show I’ve been meaning to catch up on while I’m baking, then I feel like I’ve saved time by not sitting down to watch the TV show later! Well you may as well, I’ve made enough to feed an army!…well, as long as there are only 23 people in the army, and they only want one roll each. Check this out. 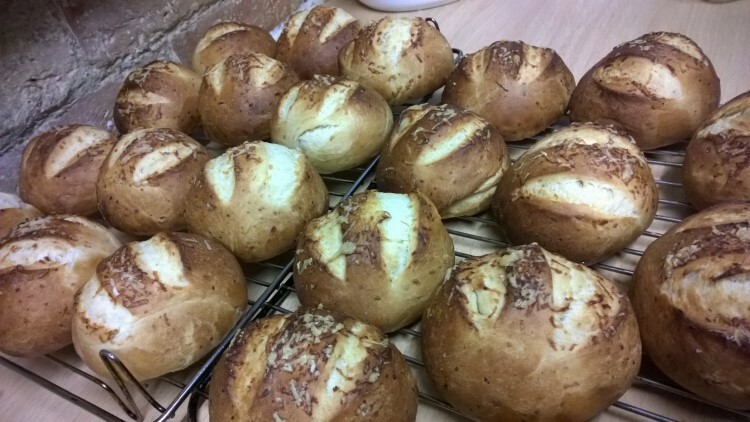 My bread recipe got a little blog love on Vanessa-Jane Chapman’s food blog. She even created a more user friendly recipe. She writes, she cooks, she does it all. Hi there, nice to meet you too! Your gravatar picture looks familiar, I think I’ve seen you popping up here and there! I froze about half of the rolls. I’m used to freezing bought sliced bread, and then toasting it right from frozen, but I’m hoping the rolls won’t go soggy! They should be fine, I’ve double-wrapped them – individually and then into a bigger freezer bag. I could always crisp them up for a minute or two in the oven after defrosting if needed! That’s ok, you might have felt it was too presumptuous to post the link without me asking for it! I would have asked for it though if I hadn’t been able to easily find it, but the search box on your blog did the job well! I’m here from Craig’s blog too. I asked him for this recipe after he posted that he was making them and then I’ve been off NaNo’ing and must have missed him putting it up. Thanks very much for making it more recipe-like; I can’t wait to try these! These look delicious, and I think the preparation work would help burn off some calories before eating them! 🙂 Once I have a bigger kitchen again, I definitely want to get back into baking bread at least a few times a year. Yes, making bread does always feel like a good workout! I’ve never made so much bread in my life as I’ve made in the last few months! Yep, more in the freezer!